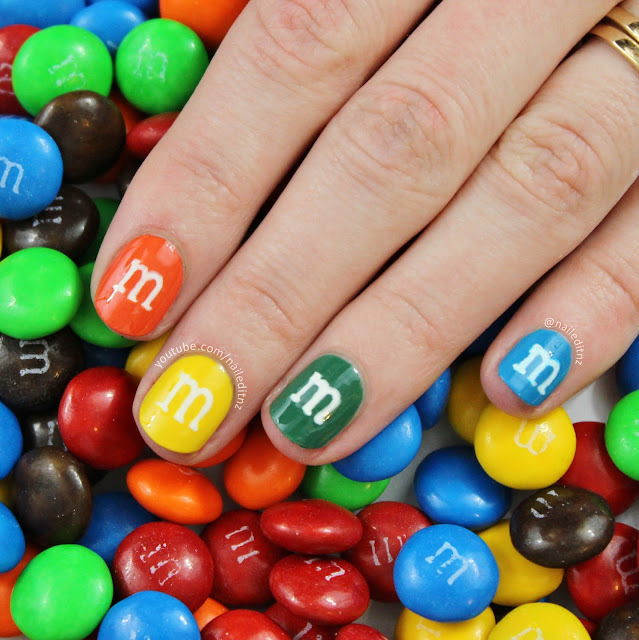 Nail Art Mash Up #4 - Birthday, M&M's, Minecraft & more! Hi everyone - time for an update! 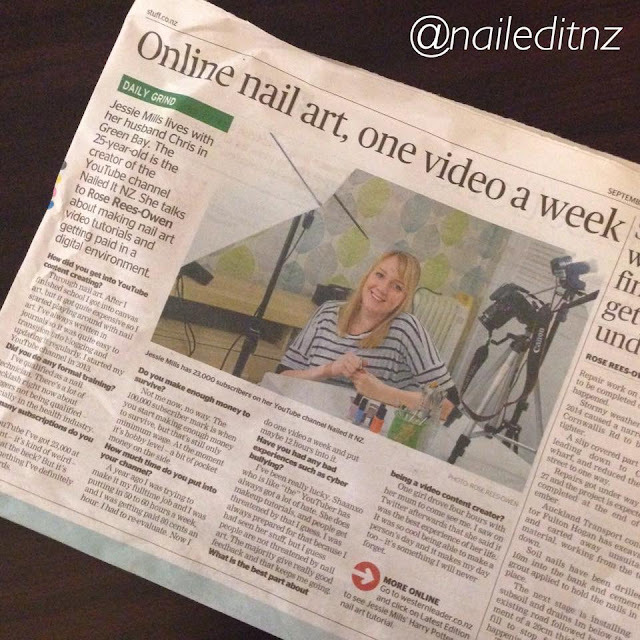 Today I've got six new videos to show you, one of which is a challenge and the rest are nail art tutorials. As with my previous few posts, feel free to click on the pictures to go to the tutorial. First up is my newest one - Birthday nails. At the time of writing this it's only been live for about 11 hours, which is still exciting to me, even though I have uploaded almost 200 videos on my channel now! 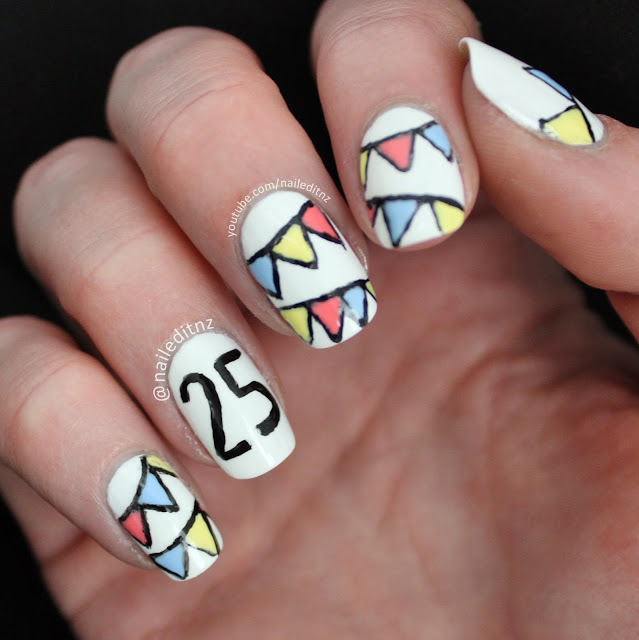 This birthday nail art was actually filmed back in July, for my birthday, but due to my once-a-week upload schedule it kept getting pushed back as I uploaded more relevant content. It finally made it. I love the pastel colours in this - I'd chose pastels over shimmers any day! A full list of the nail polish used is in the video description. 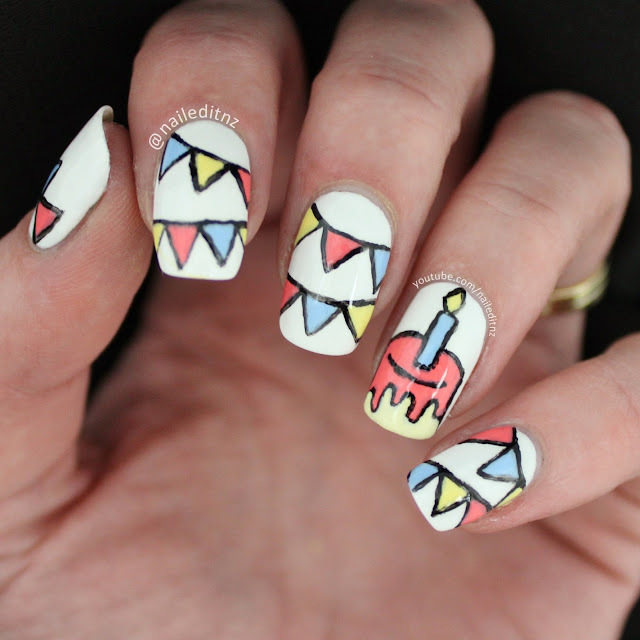 Click the image to watch the tutorial for these Birthday nails. You'll see in the video that I actually had to change the ring nail - sometimes it just doesn't look right first time around! I'm collecting footage that didn't work out at the moment, so I can eventually make a "nail fails" video. My most epic nail fail I deleted before I even uploaded it to my computer, and I always regretted it... it was so bad that it was good! Wednesday's tutorial was the first of my new series - nail art for short nails! I don't have a playlist up for this yet (it would look a bit lonely with one video) but I'll make one once I have a couple more up. As you can see, I've done m&m's! This design is absolutely perfect for little nails; in fact, it actually looks a bit strange on longer ones so finally shorter nails can win! I cut all my nails down to nubs to start this series, and now I've got five tutorials filmed I can grow them again. It felt so weird when they were this short - almost painful! 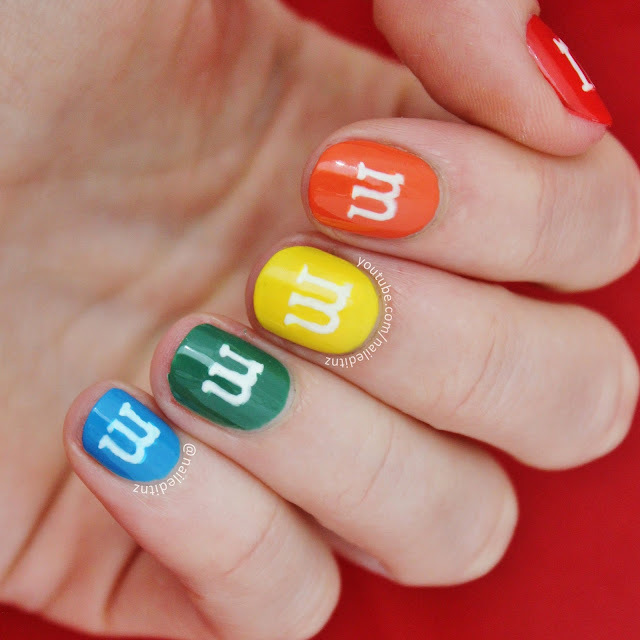 Click the image to watch the tutorial for these m&m nails. I couldn't chose just one or two photos of these to put up, so I've used three. I had heaps of fun with the m&m's in the photos - but they didn't last long once that camera was down! You'll see at the beginning and end of the tutorial that Chris (hubby) poured all the m&m's into my hands - I was like a little kid when that happened! The footage wasn't quite as amazing as I had hoped it would be, but still pretty cool. Also, I started the nails before Chris came home with the m&m's, so I got the shade of green a bit wrong. I'm not worried too much though, as I think the white 'm' would be pretty hard to see over such a light background. 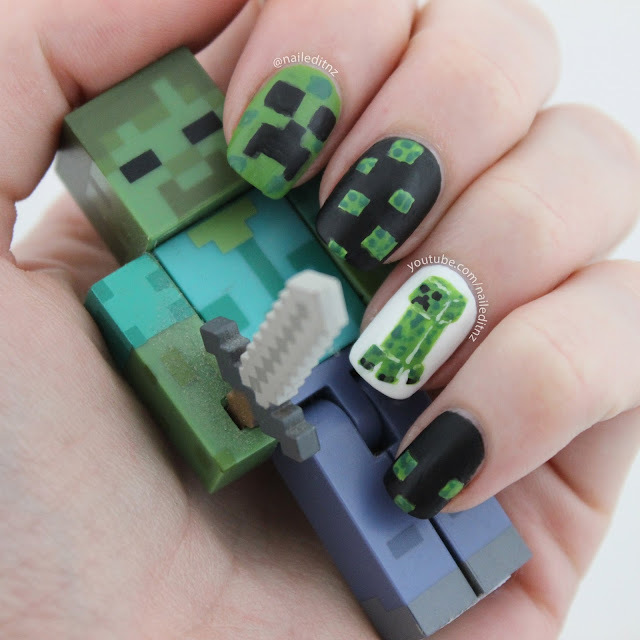 Next is some Minecraft nails! These were off my requests list, plus I know a couple of little boys who were begging me to do them! These will feature in my 'nail fails' video, whenever it happens, as the first time I tried painting the ring finger it looked awful. I was trying a different design but was a bit ambitious and nope, no way was that going to do. It's always annoying having to start again, but usually worth it. This is the right hand - which turned out surprisingly well considering I'm not left handed! I have a tutorial about how I paint with my left hand here. 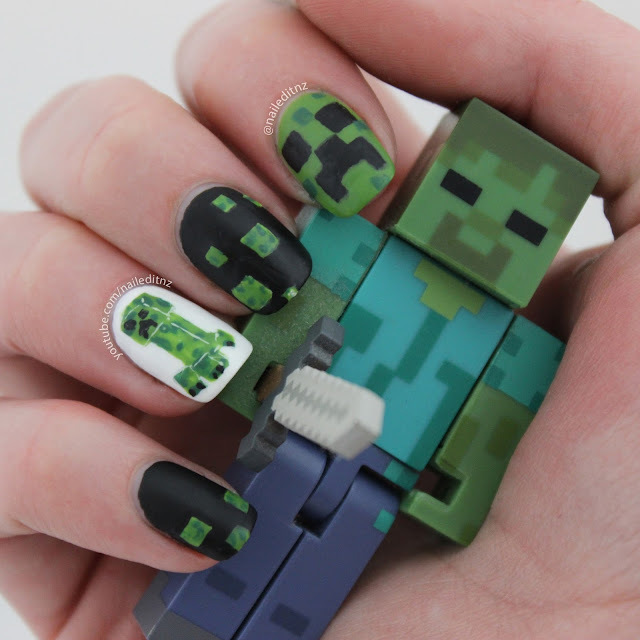 Click the image to watch the tutorial for these Minecraft nails. And here's the left hand. Loved doing these! The creeper on the ring finger turned out pretty cute. I'll probably do some more Minecraft nails one day - maybe Hero Brine or some of the animals. 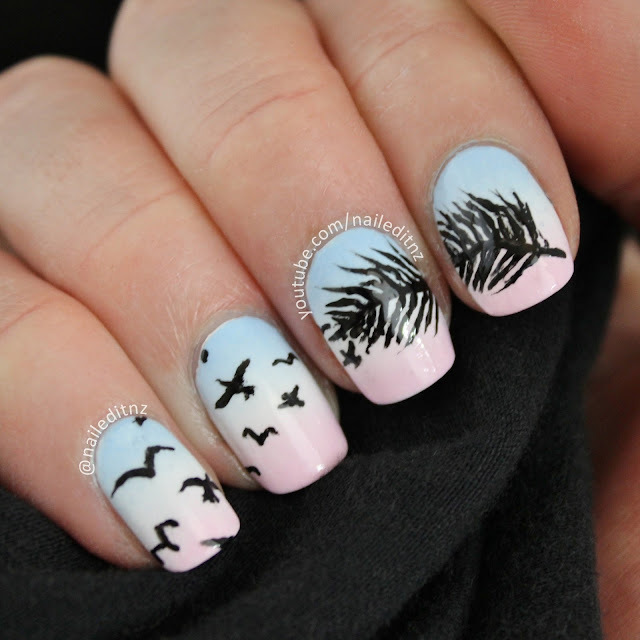 These Birds of a Feather nails were pushed forward, thanks to votes on social media! They went up two weeks ago and are one of my favourite designs, so beautiful. I always feel slightly uncomfortable doing designs that are popular, as it's near impossible to know who first did them. I just try make them my own in some way, and ask others to share if they know the original designer. 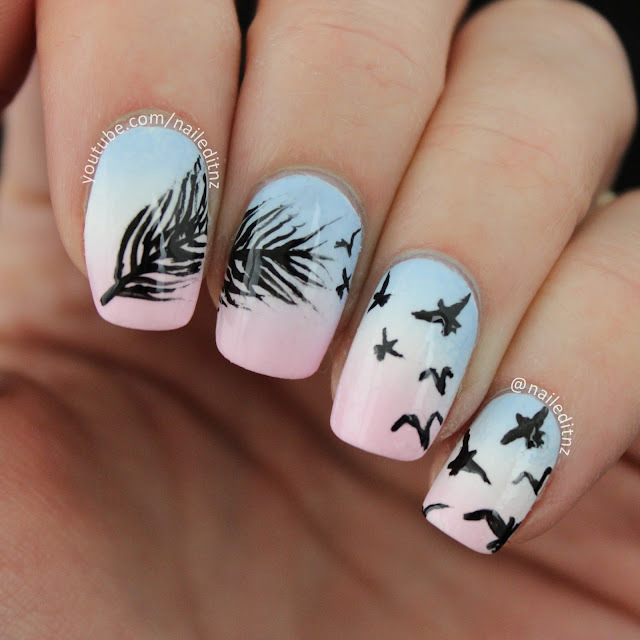 Click the image to watch the tutorial for these Birds of a Feather nails. 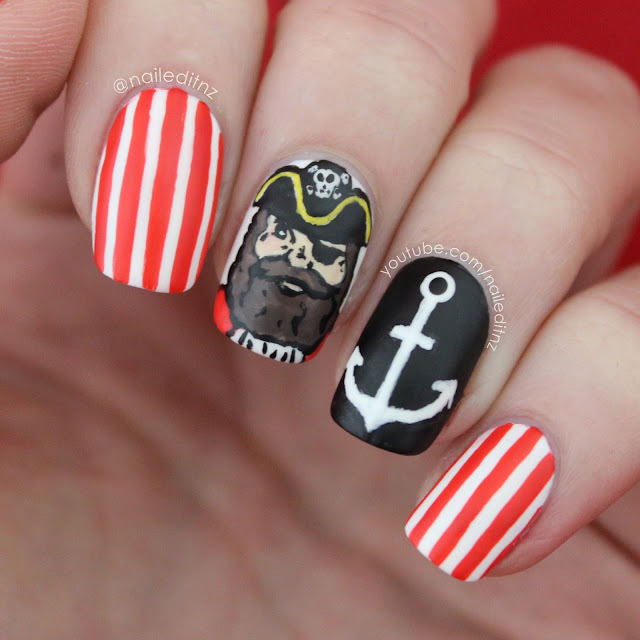 Here we have some Pirate nails - I LOVED these ones! The little pirate dude came out so cute, and anchors are another one of my all-time favourite designs. 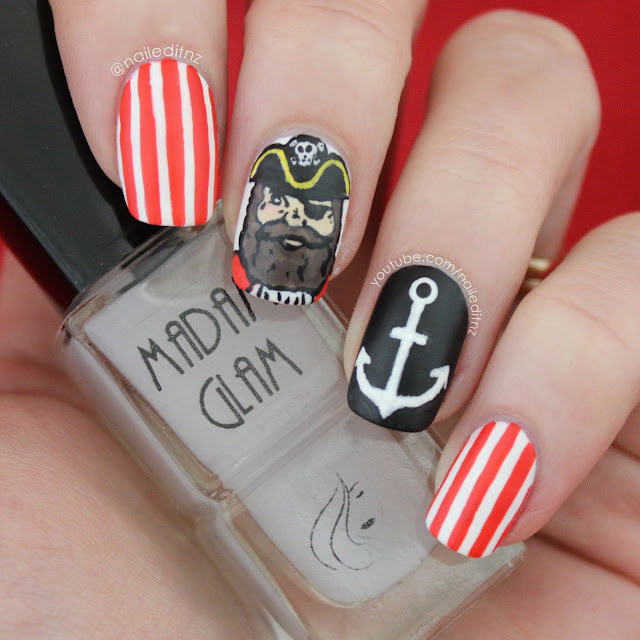 Click the image to watch the tutorial for these Pirate nails. This makes me want to have a Pirate movie marathon, now. Hook, anyone? That's it for the nail art videos, but here's a nail challenge that Bridgette and I did! This was a heap of fun, but also felt SO INCREDIBLY WRONG. I ended up being lazy and keeping my poorly-painted nails on for a couple of days, even though I cringed every time I looked at them. At least the colour was pretty! Something pretty cool happened lately, too - as you can see, I was in the paper! A year ago a very similar thing happened, but the [insert expletives] journalist never published the article. I was pretty gutted, and angry too, as he didn't even bother replying to my email questioning why. However, this reporter - Rose - was so lovely and communicative! Aucklanders are a good bunch ☺. If you follow me on social media or of course, YouTube, you may have noticed that I've recently doubled my upload schedule to two a week! This definitely requires better time management, but so far I'm keeping up. I had a huge backlog of footage, and with Halloween coming up I really wanted to get it all up now, rather than waiting until November. Speaking of Halloween, I did the most disgusting, amazing, awesome nails ever for a tutorial (modest, I know), and I cannot WAIT to upload them! Bring on October!